Reigning ONE flyweight king Geje Eustaquio is preparing to end his long-standing rivalry with former champion Adriano “Mikinho” Moraes. Each man has a win over the other, and the two are now scheduled to face off in one of the most anticipated rubber matches in ONE Championship history. They will collide for a third time in the main event of ONE: Hero’s Ascent, to be held at the Mall of Asia Arena in Manila, Philippines on January 25. The bout will be for Eustaquio’s flyweight strap. Moraes and Eustaquio first met on September 2014 in the main event of ONE: Rise of the Kingdom. Then, Geje Eustaquio was competing in the first world title opportunity of his career. Moraes foiled his first attempt when the Brazilian took advantage of his grappling skills to make Eustaquio tap out by way of a guillotine choke. The Filipino admitted that the loss was a hard pill to swallow, but that it forced him to realize what he lacks and what he needs to work on. “That loss has taught me a lot. Ever since then, I have worked extensively in improving in all areas,” he said in a recent interview with onef.com. Geje Eustaquio, then the interim titleholder, tied the series four years later at ONE: Pinnacle of Power held last June 2018. Eustaquio showcased his much-improved skillset and won by a very close split-decision to become the undisputed ONE flyweight champion. “In our rematch last June, I was able to execute my game plan properly and defended his grappling effectively. I was also able to score some takedowns on my own, which I know surprised him and confused him,” he said. The Team Lakay staple has now been given the chance to bring his rivalry with Moraes to a conclusion. 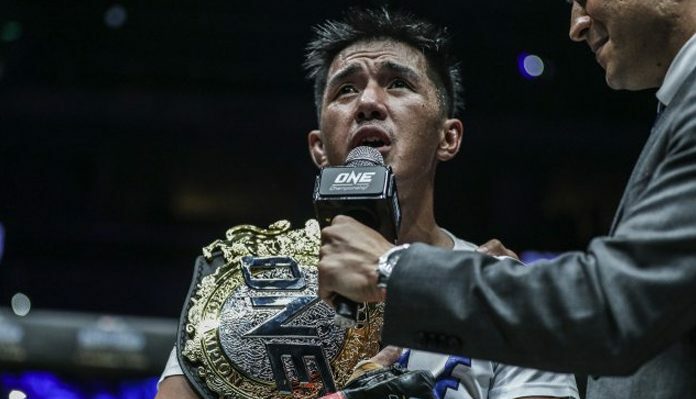 A win over “Mikinho” would cement his name as the best flyweight in ONE Championship. “It is the biggest of my career, no doubt. I am treating this bout as the most significant of my time as a professional mixed martial artist, but because of my hard work and preparations, all that is left is to give the performance of a lifetime,” Eustaquio concluded.